DUTCH antifascists have seen off an attempt by British extreme rightists EDL to export their brand of thuggery across the North Sea. 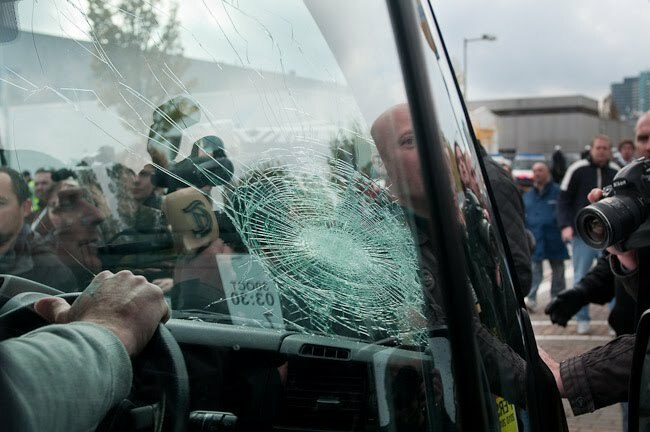 Intending to lend support to the anti-immigrant politician Geert Wilders, the EDL found themselves outnumbered by opponents, including Ajax football fans, and had their minbus trashed. Says a statement from Antifa! Amsterdam "The demonstration of the EDL / DDL was an outright failure, not more than 50 protesters eventually took the trouble to show their support for Wilders. "This while the organization, even after the forced relocation to a midle of nowhere spot in the western docklands, still said this week to expect up to 1,000 supporters. "In the end, the meager turnout (in particular on the part of the Dutch Defence League, only a few of the protesters were Dutch) and the fierce resistance that they were confronted with should be an omen about the future prospects of their crossing of the channel. "This while simultaneously a broad range of hundreds of people and dozens of groups showed throughout the city their disapproval and anger about the coming of the racist scum to the capital. "Antifa! Amsterdam expresses support and appreciation to each and everyone who has gone out on the streets today against racism and xenophobia. "From the hundreds of protesters who protested at 1941 general strike monument, the dozens of activists that spread over the city to prevent that the EDL would still showup in the center, to the many people who decided to ignore the emergency orders from the mayor and went in direct action in the docklands. "The great variety of people who have come today in opposition is a clear signal, from young immigrants to experienced activists, from soccer fans to social organizations. "In particular, the presence of Jewish individuals and the reform movement in Iran, for whom the EDL pretends to speak, and the high turnout of football fans that the EDL consider as their natural support, show that people are not deceived by the EDL. " In summary Antifa! Amsterdam considers the day as overwhelmingly successful, and calls on everyone to keep fighting, in resistance against discrimination, hatred, fear and extreme right violence." KHIMKI hostage Alexei Gaskarov has been released from police custody by a Russian municipal court. On July 28 this year more than two hundred young antifascists and anarchists carried out a spontaneous demonstration outside the town administration building in Khimki, a suburb of Moscow. They were protesting in defence of the Khimki Forest, under threat from plans for a toll motorway. The demonstration, during which several windows were broken, received a great deal of public attention. The authorities responded with a wave of repression. The day after the demonstration, two well-known social activists, Alexei Gaskarov and Maxim Solopov, were arrested. A statement on October 22 posted on Infoshop news says: "Judge Svetlana Galanova made the decision to release Gaskarov on his own recognizance, ignoring an appeal from the prosecution to leave him in police custody. "Alexei reacted by saying that he had not expected this decision because he has no faith in the Russian justice system. "The prosecution presented no new arguments to support its request to keep Gaskarov in police custody, with the exception of a report issued by the FSB. "The report states that Alexei Gaskarov has been a member of the Antifa IYA (apparently, 'informal youth association') since 2007; that he has extensive contacts, including with foreign countries, which is corroborated by his multiple trips abroad; that he has participated in and organized unsanctioned protest actions; and that the last time he was detained was on March 20, 2010, during the Day of Rage protest action. "In his testimony, Alexei stated that antifascism is not a crime, that his antifascist views cannot be cause to place him under arrest, and that his trips abroad are his own personal affair. "Gaskarov told the court that he was present at the March 20 Day of Rage protest in his capacity as a correspondent for the Institute for Collective Action (IKD) and that after his arrest he had been acquitted of all charges by a justice of the peace. "Gaskarov had likewise traveled to Khimki on July 28 as an IKD correspondent, which was confirmed in a letter submitted by the institute’s directors. "Civil rights activist Lev Ponomaryov, who participated in the hearing as a counsel for the defense, likewise voiced his bewilderment over the fact that the prosecution had portrayed antifascist convictions as a negative character factor, whereas in reality society should be proud of such people because they protect it from fascism. "According to Ponomaryov, it is a very good thing that such people are resolute in their convictions. "The court heard testimony from Andrei Demidov, deputy director of the Institute for Collective Action. Demidov confirmed that Gaskarov had been dispatched to Khimki as an IKD correspondent. "Georgy Semyonovsky, Gaskarov’s lawyer, reminded the court that five well-respected citizens — Lev Ponomaryov, executive director of the For Human Rights movement; civil rights activist Sergei Kovalyov and Liudmila Alexeeva; and State Duma deputies Ilya Ponomaryov and Oleg Shein – had agreed to vouch for his client’s reliability. "On October 18, the Khimki Municipal Court likewise released Maxim Solopov from police custody on his own recognizance. Like Gaskarov, Solopov has been charged with disorderly conduct for his alleged participation in a protest action outside the Khimki town hall. "The Campaign for the Release of the Khimki Hostages congratulates Maxim Solopov and Alexei Gaskarov on their conditional release from police custody, but believes that it has not achieved its goals and intends to keep fighting until all charges against them have been dropped. 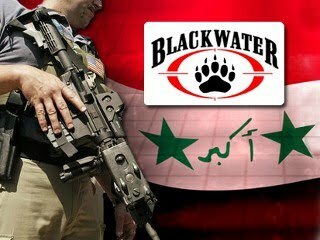 AFGHAN President Hamid Karzai has said US private security firms, including Xe Services LLC, formerly known as Blackwater, are behind terrorism in the country. Press TV reports that at a press conference in Kabul, Karzai said that US security companies have been behind explosions that have claimed the lives of women and children. The Afghan president added that they have caused 'blasts and terrorism' in different parts of Afghanistan over the past months. Many observers have linked the USA to false flag terror operations in the past, ranging from the notorious Gladio network in Europe to strong connections with al-Qaeda. ANARCHISTS in Barcelona have carried out solidarity actions in support of activists in Russia and Belarus who are fighting to save the Khimki forest. A statement published by Angry News From Around the World says: "The night of Monday, October 18, we wanted to make a small gesture of solidarity with anarchist comrades of Khimki (Russia) and Minsk (Belarus), imprisoned by their respective States in August 2010. "The gesture consisted of moving in three locations linked to the Russian State and its commercial interests. "Profiting our friend darkness, we went to the Russian consulate, to the headquarters of the Russian airlines the Centre for Culture and Russian language in Barcelona. "We threw paint-filled eggs against these dumps and sprayed slogans in solidarity with the comrades. "Death to all patria, border states, capitalism and every form of authority." STRIKING oil refinery and port workers have blocked access to Marseille airport as the French government grapples with a 10th day of strikes and confrontations. About 500 workers from the l'Etang-de-Beurre refinery and others including airline and postal workers, blocked the access road to the airport, which serves local and nearby international destinations, from dawn, reports MSNBC. "No vehicles can get through to the car parks," Medhi Rachid of the CGT union chapter at a nearby refinery in Bouches-du-Rhone, told Reuters. The renewed demonstration came a day after President Nicolas Sarkozy sent in police to clear access to barricaded fuel depots and restore supply as trade unions kept up their resistance on Wednesday to a pension reform due for a final vote this week. Workers opposed to a two-year higher retirement age also blocked roads to airports around France, leaving passengers in Paris dragging suitcases on foot along an emergency breakdown lane. 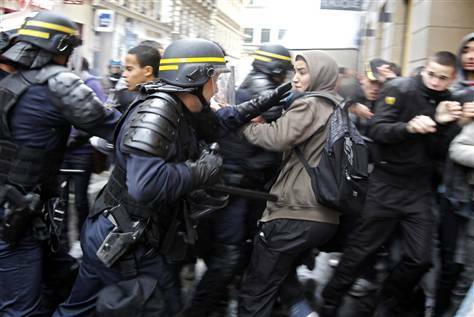 Outside the capital, notably in Lyon [pictured] hooded youths smashed store windows amid clouds of tear gas. Riot police in black body armor forced striking workers away from blocked fuel depots in western France, restoring gasoline to areas where pumps were dry after weeks of protests. Riot officers in the Paris suburb of Nanterre and the southeastern city of Lyon sprayed tear gas but appeared unable to stop the violence. With a Senate vote on the reform expected on Friday at the earliest, unions were ramping up the pressure with strikes, go-slows on main roads by truck drivers and work stoppages at regional airports. Fuel imports hit a record high on Tuesday, the government said, as it tried to get round a 24-day blockade of France's largest oil port, near Marseille, where 51 oil tankers lay idle in the Mediterranean, unable to dock. With more than 3,000 service stations out of nearly 12,500 in France out of fuel, police could also be deployed to clear access to striking oil refineries, according to Sarkozy's order. A large rally is scheduled in central Paris on Thursday afternoon. 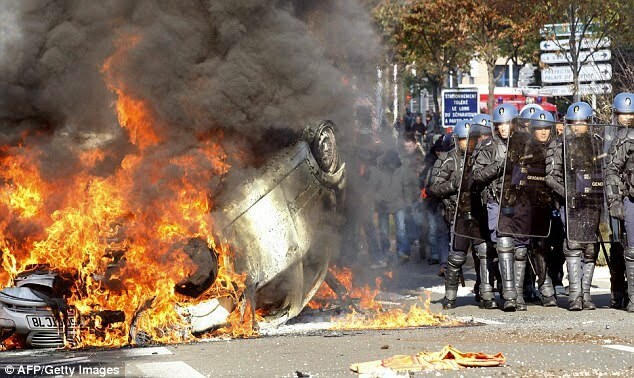 RIOTS are breaking out across France, as the population shows its anger at the neoliberal 'austerity' measures being imposed on them by the hated Sarkozy regime. 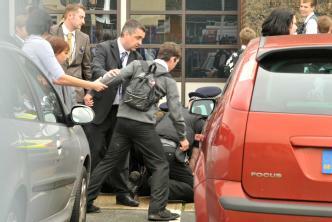 Secondary school children have been blockading schools and youngsters have been fighting back against the police. In several cities cars have been torched and molotov cocktails thrown at riot cops. A college near Le Mans was set on fire and burnt to the ground. The authorities say that 290 'casseurs' (hooligans) were arrested on Monday alone. University students, who have not so far been involved, are now about to also join in the battle, raising the stakes still higher. Because of union blockades of oil refineries, petrol is running out across the country, with two-hour queues forming even where fuels is available. Airports and railway lines have been blockaded and lorry drivers staging 10mph 'snail' protests to block congest roads. Poll show a massive 70% of the public support the strike, but President Sarkozy refuses to back down from his authoritarian capitalist position. Comments the Daily Mail: "Many fear a re-run of the May 1968 riots in Paris when thousands took to the streets to try to bring down the government of President Charles de Gaulle." Tuesday sees another day of mass action and strikes - and the momentum currently seems to lie firmly with the street. 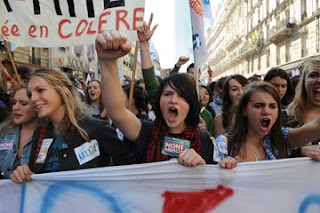 A YOUTH revolt is kicking off on the streets of France, as resistance to the neoliberal Sarkozy regime deepens. Protests by secondary school students were met with police violence in several cities, enraging the youngest generation and paving the way for more angry confrontations in days to come. Pupils have been blockading the entrance to schools with makeshift barricades in their support for the wave of protest which has been focused on changes to the retirement age but has now taken on a much wider agenda. Reports The Daily Telegraph: "France's BFM TV showed images of groups of students toppling waste containers in southeast France and erecting barricades in the middle of a Paris avenue. 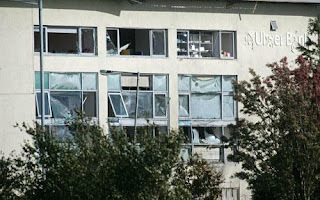 "Police in the Val-de-Marne region southeast of Paris detained about 15 students for hurling projectiles at police and vandalising property. "One student was injured when he was hit by a rubber flash-ball fired by police in the Paris suburbs, and another was taken to hospital in Bordeaux after clashes. 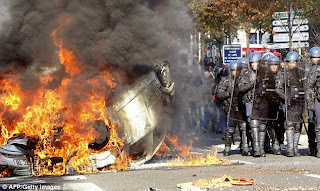 In scuffles elsewhere, students in Lille burned a car and rubbish containers." The Green Party Mayor of Montreuil, Dominique Voynet, condemned the police for shooting at children, adding that the teenager hit by the flash-ball risked losing his eye. A big day of demonstrations this Saturday is to be followed by another day of strikes and protests on Tuesday October 19. 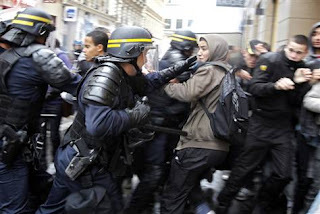 FRENCH resistance to the neoliberal 'austerity' measures being imposed on the people of Europe is nearing crunch point. Millions took to the streets across the country on Tuesday in the latest of a series of defiant general strikes. Even the government was forced to admit that the protests were bigger than previously. And, in an extraordinary development, Le Monde reports that the police in Marseilles have been accused of lying about the turnout - by the cops' own trade union. Whereas organisers reported that a massive demonstration in the Mediterranean port had attracted 230,000 people, the police estimate was a paltry 24,500. The union 'Unité SGP police' accused senior officials of making out the protests were diminishing while they were in fact growing and of crossing the line between public service and politics. With another day of action planned for this Saturday, Sarkozy's regime is being put under enormous pressure. But the stakes are high - a forced climb-down over the retirement age in France would send a signal out across the continent that the neoliberal shock doctrine can be defeated on the streets. A DAY celebrating the conqeust of America by Europeans has attracted protests across the USA. The Boston Globe reports, for instance, reports: "Instead of the daring adventurer who opened the New World, critics say, Columbus opened the way to the enslavement and death of millions of indigenous people in the Americas." It quotes protester Alex Papali, an organizer with Resist the Raids, an advocacy network that is critical of immigration enforcement. He tells the paper: "We are taught to honor this man, Columbus, who represents the worst of humanity. We are doing the right thing by standing against 500 years of mind control." RT reports ReconsiderColumbusDay.org as declaring: "For way too long, Columbus created heinous crimes against the indigenous populations of the Caribbean and millions of Natives throughout the Americas. And Columbus set the stage for the slave trade in the New World." 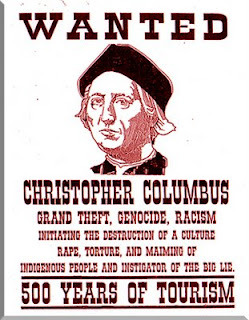 It describes protests at Arizona State University, San Juan Capistrano, California and Boise State University in Idaho, where protesters thanked Columbus "for humiliation, extermination, indoctrination". POLICE were called to a school in Kent, UK, after hundreds of children walked out of lessons in protest over changes to the timetable. Reports the BBC: "Between 200 and 300 children are understood to have taken part in the protest at Dover Christ Church Academy. "Pupils said the protest was mainly about changes to the lunch hour, which meant they were split into two groups." The school gate and three or four cars belonging to staff were all damaged. DISSIDENT Republicans in Northern Ireland have bombed a bank, less than a month after they warned they would be doing just that. The car bomb badly damaged the Ulster Bank in Culmore Road, Derry. Nobody was injured but the attack was widely condemned by the British and Irish establishment. In September the underground group described bankers as criminals and told The Guardian: "We have a track record of attacking high-profile economic targets and financial institutions such as the City of London. "The role of bankers and the institutions they serve in financing Britain's colonial and capitalist system has not gone unnoticed. "Let's not forget that the bankers are the next-door neighbours of the politicians. "Most people can see the picture: the bankers grease the politicians' palms, the politicians bail out the bankers with public funds, the bankers pay themselves fat bonuses and loan the money back to the public with interest. 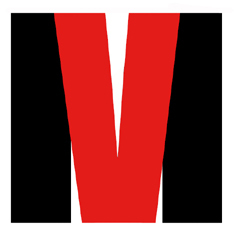 "It's essentially a crime spree that benefits a social elite at the expense of many millions of victims." RESISTANCE to the American-led occupation of Afghanistan has stepped up over the last few days. Says The Press Association: "Three explosions just minutes apart have rocked Kandahar, killing up to four Afghan police officers in the nation's largest city in the south. "Three Nato service members also were killed by bombings in southern Afghanistan and an insurgent attack killed another in the east, raising the coalition's death toll to 11 in the first four days of October." 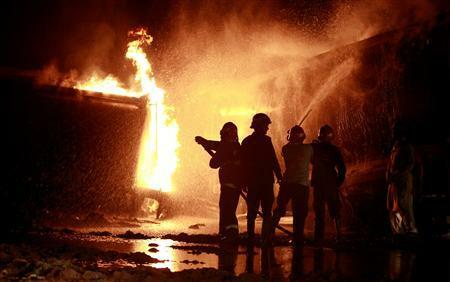 Meanwhile, as The Independent reports: "The Pakistani Taliban yesterday claimed responsibility for setting fire to more than a dozen oil tankers carrying fuel for Nato troops in Afghanistan. "The attack on the convoy in the garrison town of Rawalpindi where Pakistan's army is headquartered is the latest in a series by militants and 'would continue until the supplies are completely stopped', said Azam Tariq, a spokesman for the group. "It was the fourth such attack on a Nato convoy since Pakistan shut down the Khyber Pass crossing in apparent protest over a series of airstrikes by Nato helicopters in Pakistani territory, including one that killed three Pakistani soldiers. "The shutdown left lorries parked and vulnerable to attack. Before dawn yesterday, a dozen attackers sprayed the vehicles with automatic gunfire. Four people were killed as the trucks were then set ablaze. A further two trucks were in flames hours later." PROTESTERS took to the streets of Reykjavik, forcing MPs to run away from the people they represent as renewed anger about the impact of the financial crisis erupted in Iceland. 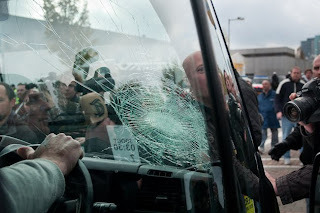 Reports The Guardian: "The violent protest came amid growing fury at austerity measures being imposed across Europe. "Disruption in more than a dozen countries this week included a national strike in Spain and a cement truck driven into the Irish parliament's gates. 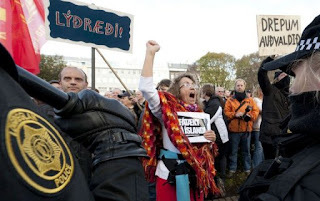 "Witnesses said up to 2,000 people caused chaos at the state opening of the Icelandic parliament, with politicians forced to race to the back door of the building because of the large number of protesters at the front. "Eggs were said to have hit the prime minister, Jóhanna Sigurðardóttir, other MPs and the wife of the Icelandic president, Ólafur Ragnar Grímsson. "Árni Páll Árnason, the minister of economics affairs, who was caught up in the protests, said: 'We have a difficult economic situation and this is something to be expected in a democratic country'. 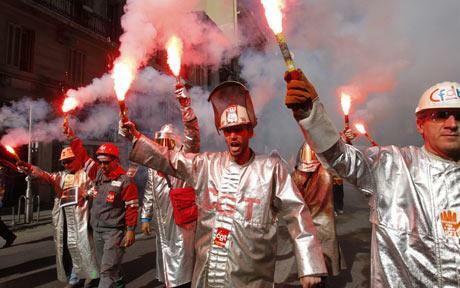 "A UN agency has warned of growing social unrest because of a long 'labour market recession' that could last until 2015. The International Labour Organisation revised down its forecast and estimated that 22m new jobs were needed to return to levels before the banking crisis. "Juan Somavía, director general of the ILO, said social cohesion would be at risk, adding: 'Governments should not have to choose between the demands of financial markets and the needs of their citizens'. "The protests came in the same week as demonstrations in Greece, Portugal, Slovenia and Lithuania. "According to the writer Hallgrímur Helgason, anger has flared in Iceland because of the increasing numbers losing their homes and fury that only the former prime minister Geir Haarde has been charged with negligence over the financial crisis. The parliament voted this week to charge Haarde, who has said he is confident he will be vindicated, but not three others facing similar charges. "Iceland was at the centre of the financial crisis and took out loans from the International Monetary Fund and its Nordic neighbours after the collapse of three main banks in 2008. "Birgitta Jónsdóttir, one of three MPs to join the protesters, said: 'There is a realisation that the IMF is going to wipe out our middle classes'."